Wikipedia: "Sylvie is fascinated by the portrait of long dead Alain de Francigny and she is upset when her father, Baron Eduard, is forced to sell the painting. The Baron hires an actor to appear as Alain's ghost on the eve of Sylvie's 16th birthday, as a joke. Two admirers of Sylvie decide to also appear as ghosts. All this annoys the actual ghost of Alain de Francigny, and he too makes an appearance..."
"The special effect of the ghost appearing was achieved by filming through a glass pane and using two identical sets. Through the glass, the primary set would be visible. This was a regular set where all actors appeared, except the ghost (Tati). At the same time the reflection would be visible of the second set, placed at a ninety degree angle to the primary set. This set was covered entirely in black velvet, and the only actor on this set was Tati (see Pepper's ghost)." Claude Autant-Lara was already a veteran of the film industry when he finally established himself as a film director in films signed by himself, no longer hiding behind the name of Maurice Lehmann, in four films starring Odette Joyeux (Le Mariage de Chiffon, Lettres d'amour, Douce, and Sylvie et le fantôme). The touch is assured in the final film of the cycle, the ghost comedy Sylvie et le fantôme. The ghost film was a special phenomenon in the 1940s and the 1950s in many countries that had experienced the war, also in our country (Linnaisten vihreä kamari), and also including masterpieces such as The Ghost and Mrs. Muir, and Ugetsu monogatari. The devastation of the war had been overwhelming. The presence of the absent ones was a shared feeling among the survivors. The approach to the ghost stories was often humoristic. In France, great auteurs appeared as ghosts: Jean Cocteau in Le Baron fantôme, and Jacques Tati in Sylvie et le fantôme, both starring Odette Joyeux. Like in The Ghost and Mrs. Muir, there is here a love affair between the female protagonist and the male ghost. Sylvie et le fantôme starts with the sale of the beloved painting, but the ghost remains in the castle all the same. Comedy ensues when three fake ghosts are hired to the midnight ball as a special treat to Sylvie. One of them is played by a professional ghost actor, seasoned in performances of Hamlet, among others. The grand finale, the great revelation, is supposed to be that the ghost is an illusion, but instead, the true ghost appears for one last time, before ascending to the heaven, wearing the ring, accompanied by his faithful hound dog. For me, the sense of these ghost stories is about the transitoriness of being, and in this sense there is a general affinity even with the post-war films of John Ford (My Darling Clementine) and the entire late oeuvre of Yasujiro Ozu. 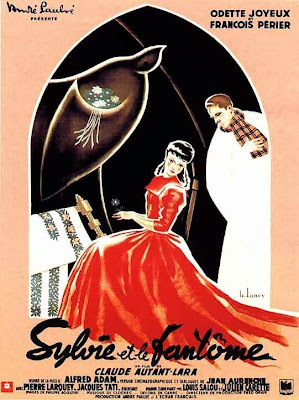 Sylvie et le fantôme is a genial film but it does not yet have the brilliance of comedy timing such as in Occupe-toi d'Amélie. There are even scenes which feel long drawn out. The special effects, based on the Pepper's ghost concept, are impeccable, and the ghost belongs to the most impressive in the history of the cinema, comparable with Victor Sjöström's Körkarlen / The Phantom Carriage. For Jacques Tati aficionados this his first appearance in a feature film (with a special credit title card) is a must. The print looks like it has been constructed with great care from partially very challenging (even 16 mm?) sources. Our projection was unfortunately not perfect as the mirrors of the second projector are still being adjusted. Also the reflection from the subtitling projector is distracting.